Sinn Féin said while the two political parties are figuring out who will govern, crises in housing and health continue. SINN FÉIN LEADER Gerry Adams is calling around independent TDs from the Anti Austerity Alliance, the Social Democrats, Clare Daly and Mick Wallace to see if they can work together to solve the homeless and housing crisis from the opposition benches. 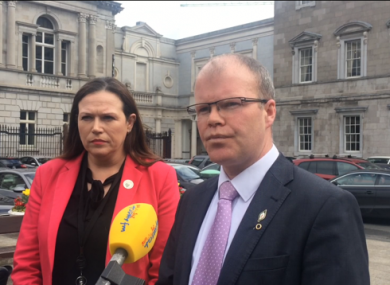 Sinn Féin’s Peadar Tóibín said while Fine Gael and Fianna Fáil continue their “charade”, Adams is taking an “active role” in contacting independent TDS from the “progressive side of the chamber” to formulate a common plan on how to solve the issue. He said while the two political parties are figuring out who will govern, crises in housing and health continue. “You people in poverty, wait. You people in the housing crisis, wait. You people in health crisis, wait, because our priorities come first, and that’s wrong,” he said. Yesterday, before the vote for An Taoiseach, Sinn Féin put forward a motion to appoint an Oireachtas committee, similar to the Dáil reform committee, to deal with the ongoing crisis. “We have been denied the right to move that motion and the Taoiseach, thus far, has declined my request to facilitate this necessary initiative,” said Adams. Tóibín said Sinn Féin were hoping for a positive, non-partisan response from the TDs. Yesterday Erica Fleming, a young homeless woman who has been living in emergency accommodation for nearly a year with her nine-year-old daughter, Emily, gave a briefing at Leinster House. Tóibín said strong points were made at the meeting. “The days of individual parties shunning working together on these issues should be over,” he said. Want to get on with the job we were elected to do. It’s not right to say to people who elected us to do a job, now you have to wait we haven’t time deal with your mother on a trolley, you have to wait; we haven’t time to deal with the fact that your children are waking up in a bed and breakfast this morning, you have to wait. That’s not fair. She called on Fine Gael and Fianna Fáil to get on with the job of forming a government, saying “there isn’t a width of a credit card between their policies”. “It was farcical yesterday to see Fine Fáil and Fine Gael trade and swap insults in the Dáil,” said Tóibín. He said both parties had allowed their “political agendas supercede the crises going on right around the country”. Email “'It's not fair to tell people waking up in emergency accommodation they have to wait'”. Feedback on “'It's not fair to tell people waking up in emergency accommodation they have to wait'”.